You know the story. By now, everyone does. 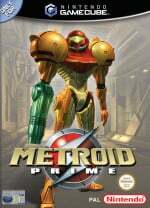 In 2002, a new Metroid game was released after nearly a decade of silence, and it was done by a little studio in Texas that no one had ever heard of. Oh, and it was 3D. And first person. It shouldn't have worked, but it did, and the ensuing trilogy would secure that little studio as one of the most respected, reliable developers in the world: Retro Studios. You know this story because you've heard it before. Gaming reviewers, critics, journalists; they love to talk about it. And why shouldn't they? It's a good little underdog story; it reminds us that sometimes the biggest successes come out of unexpected places, that sometimes change is for the better. But that story, as good as it is, does distract from the fact that Metroid Prime, the game they created, wasn't a shocking success because of the odds stacked against it; it was a shocking success because it was, and still very much is, an uncommonly brilliant game. Like its predecessor Super Metroid, Metroid Prime was a pioneer in subtle, visual storytelling and dark ambience. The ruined alien world of Tallon IV is an astonishing achievement on every end of the spectrum; it's simultaneously beautiful and haunting, but it's more than just a pretty picture: it's an interactive playground with a story that's so deeply embedded within its core structure that it's hard to tell where the gameplay ends and the narrative begins. Notice that we said “narrative” and not “cutscenes,” by the way, because really, in Metroid Prime the cutscenes are few and far between. When they do pop up, they're brief breaks in gameplay used to set up an important scene, not long-winded excuses for wordy exposition. Rather, the narrative in Prime is discovered, not told. You're stranded on this planet, so at first the only thing driving you forward is the desire to escape. But using a clever tool called the Scan Visor, Samus, the game's silent female protagonist, can scan and learn about virtually everything in the environment, which slowly reveals the planet to be much more than it initially seems. The system does have its distinct gameplay advantages — scanning an enemy will reveal its weak point, and scanning certain terminals will activate doors and elevators — but most of your scanning will probably just be done out of awe-struck curiosity, and since the game constantly encourages and rewards this curiosity, it really ends up driving the entire experience. Scanning an alien's dead body might give you a clue to its cause of death, which may in turn foreshadow an encounter with a future enemy, and various hidden “Chozo Lore” entries start to reveal a subtle, overarching narrative. What's more impressive though, is that even scanning small, technically insignificant environmental things like plants, pipes and foliage will give you in-depth summaries of their purpose on this planet. Knowing these little details about every piece of shrubbery that passes you by won't help you beat the game, necessarily, but it makes Tallon IV feel like an actual place, rather than just a setting. Retro Studio's arresting, surrealist art direction is still a cut above most current first-person games (and its influence can clearly be seen in other atmospheric space games like Dead Space) though there's no denying that from a purely graphical standpoint the original GameCube version of the game is starting to ever-so-slightly show its age. What is timeless is the series' trademark sense of progression and empowerment, which is fully intact here in Metroid Prime; searching every twisted cave and corridor for new power-ups and upgrades is just as addicting and satisfying as it ever was, and since the game gives you very little in the way of direction, finding these items feels like a genuine discovery. This is a game where the sense of progression is completely organic; there's nowhere you can't go because you haven't reached the point in the story where it makes sense to go to that place yet. If you find a door you can't open or that's out of your reach, it's because you don't have the right item to get to it yet, and it's your job to go out and find it. The game world is certainly contrived (why would the Space Pirates build mazes that are the exact size of Samus' morph-ball? Follow up question: why would they build mazes?) but it never feels artificial, and that's the important illusion this game maintains. You walk onto this planet with nothing but a measly gun and a little morph-ball, but you'll walk off of it a human arsenal. The soundtrack is more textural than melodic, so while you probably won't walk away from the game humming many of its tunes, every song fits its respective environment perfectly. Metroid: Other M would expand upon this sort of sketchy, ambient sound design with a human orchestra and real-world instruments, but Prime's soundtrack is serviceable considering the GameCube's limitations. The game's unorthodox control scheme is often chalked up to limitations as well, but although the game isn't dual-analogue like most first-person games, after a few hours it becomes second nature, even if the lock-on system isn't quite as smooth and reliable as its slightly-superior Wii remake. Pointer controls are more immediately intuitive, but the game itself was designed around the GameCube controller, so it never feels like a dual-analogue game forced into a single-stick control scheme. Metroid Prime is still one of the greatest games of all time, but its success doesn't lie in any one avenue; its organic sense of progression, brilliant art design, extraordinarily dense and explorable world and innovative gameplay mechanics are all still impressive on their own, but it's the way the game is able to tie all these elements into one “thing” that makes this game a must-play classic for anyone who considers themselves a gamer. Am I the only one amazed that this hasn't been reviewed here yet? I have this game. It's awesome, unfortunately it's not working anymore. This game deserves nothing less than a 10! I love the beginning on the Space Pirate Frigate. I love scanning all the pirates. @UncleWolf You can pick it up for $4 or less at Gamestop. I don't think this game is that good, but it's still great. I really don't like games that don't at least help tell you what to do. Totally deserves a 10. Even an 11. Hands down one of the finest games ever created. Yep, this is DEFINATELY a 10. And no, that isn't sarcasm. If you haven't played it, do it. The 3d platforming alone should make this lose 2 points. Calling one of the more mediocre games in the series a 10 seems a bit much. Fusion was near perfection, and only warranted a 9 from here. This one is a 7 tops. Metroid Prime is the only game that can top Super Metroid. @5 It does tell you what to do. It teaches you controls as you get items, and if you flounder around for too long, it'll nudge you a bit and tell you where the next important room is. Prime is definitely the best of the Trilogy, and easily deserves a 10! Looking forward to the Echoes review! In my view Echoes is worthy of 9, while prime and Corruption are worthy of 10. All brilliant games though! One of the best video games of all time for me (on any console ever) and easily my fav metroid. The best one really. Few games had such an impact on me as this. Maybe only Ocarina and Super Mario world and the Galaxies. @Miracleblaze They've already reviewed MP2. Here is their review of it. If u haven't played this btw, go get a 2nd hand copy of Metroid Prime Trilogy Wii. @The_Fox No, it IS shocking no one has reviewed this yet. Anyway, this game is one of the greats. It was my first FPS. All I can say is this game is amazing, and I'd pop it in any day. If you have not played this game yet, you need to now. I loved this game, but got tired of the lock-on system, which I found annoying, before I took the time to finish it. I should buy a copy of the Wii compilation sometime. The whole prime trilogy was phenomenal games. I encourage anyone to pick them up. This is coming from a person that really dislikes fps games. Metroid Prime is a first person adventure. @20: Agreed. Metroid isn't a shooter, and a first-person camera doesn't change that. Sadly there was one thing lost in the otherwise flawless transition to the Wii: that amazing opening screen. I can't understand why they dropped it. That and the beautiful glow of the morph ball were the first things that amazed me about this game. 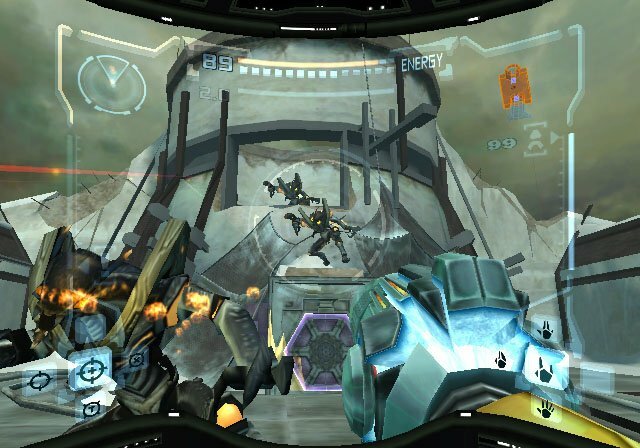 I don't like FPS games at all, and I felt that the first two Metroid Prime games were two of the best games I've ever played. 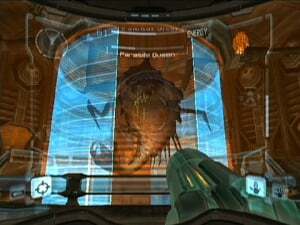 Metroid Prime 3...less so. But still decent. Awesome game, never beat it though. But I always got really far! Can you say best game ever? The most immersive 3D game (short of Puzzle Agent 1 and Portal 1) I've ever played. Leading up to it's November release back in 2002, I used to drive to BestBuy during my lunch breaks just so I could play this game before you could buy it. Haters will hate, but this game IS amazing! 12/10. Miyamoto said it himself. @ 9: Metroid Fusion near perfection? Now THAT one was rather average, short, shellow and too easy. There are few games that truly deserve a 10/10. This game is one of those games. All flaws are washed away under how very perfect this transition into 3D was. Heck, it had years of hype and the looming vision of Super Metroid to deal with, and it still came out transcendentally. @9 This was the first game ever to make first-person platforming a breeze. Did you honestly have trouble with it? Damn straight giving this game a perfect 10, Retro did such an amazing job translating this I was on the verge of tears many times while playing it just because of how well they executed everything (yes I know I'm a big baby). Metroid Prime deserves nothing less than a 10. Great review! However, I must disagree in Jacob´s statement that the soundtrack is not very addictive. Try typing in Tallon Overworld (Theme 2) on YouTube. Or Phendrana Battle. Prime´s soundtrack is one of the best ever IMO. EDIT: @The_Fox: I am, too. A briliantly polished and perfected game that is absolutely worthy of a 10. One of my favourite games of all time and the best game on GameCube. this game is nothing short of a perfect 10/10. Easily my favorite metroid game. What @MetroidMasher17 said, except I'd add in the music from the Underwater Frigate. MAN that piece of music was awesome AND very memorable. Except for the oversight on how awesome and hummable the music is, great review. Definitely worth a 10, a truly amazing game. @warioswoods I absolutely agree. I loved that opening title screen and was disappointed that it was cut in the trilogy. Oh well I suppose I still have my original game cube copy. @22: I totally agree. That and the opening screens of Echoes as well. Plus the music for both main menus was the best for both those games. Echoes had the same control scheme as the first Prime. They didn't change it at all. I don't get it. The GameCube controller had 2 analog sticks. Why didn't they just map the aiming to the second stick like every other first-person game? At least they could have offered us customizable controls. I'm so pissed that I traded in my copy of Prime Trilogy. Now I can't find it anywhere. Nintendo should have never made it a limited release. Perhaps they can re-release it under Nintendo Selects (for about $30)? You should be pissed at yourself =) I don't think "I traded in my Metroid Prime Trilogy copy" should even be an accepted English sentence, it's just too absurd. Corruption is a different beast altogether, trading in wider exploration and sense of loneliness for incredible variety and fluidity. The series' controls and artstyle are at its best, though. When I first played this game it was so amazing. It felt almost perfect. Then Echos came out and was even better! How they made a perfect game into something even better, I'll never know, but I am sure happy it happened. Too bad they had to really mess it up with MP3. One of the biggest disappointments. Metroid Prime is the definitive Metroid game in my eyes. I love Super Metroid a hell of a lot too, but I think that Prime was the complete package. Exploration, atmosphere, immersion, music, visuals - everything just clicked together. The best GameCube game by far and easily the best game of last generation. "Oh, and it was 3D. And first person. It shouldn't have worked"
Why it shoudnt have worked? By 2002 everybody else except Nintendo users was already playing 3D first person games. What did happen latter when Nintendo decided to return to a more 2D like style with Other M? This was the one not working, with sales going down in flames and poor ratings. If it were a first person shooter in 2002 it might have had even more success as that what the time of the "WOW" factor with FPS. Remember that Half-Life (a master piece) was released for PS2 in 2001 (as well as Quake 3), meanwhile Nintendo had nothing to satisfy the new army of FPS fans, the final result is that PS2 obliterated the NGC. This game was so awesome. Got my money's worth on Trilogy with just that game. Definitely a 10! @Mandoble: It shouldn't have worked because Metroid was a beloved 2D adventure game, and it was hard to believe it would survive the transition. Plenty of franchises never made the transition to 3D well, so it made sense to be skeptical at the time. Also, Other M isn't really 2D style. It's not like Prime, but it's nowhere near proper 2D, either. "You're stranded on this planet, so at first the only thing driving you forward is the desire to escape." Samus is NOT stranded! Her ship works just fine, and she could leave any time. She's there investigating Space Pirate activity, specifically having followed Meta Ridley there while escaping the frigate. I still remember the first time I played this game. It was so atmospheric that I felt genuinely terrified at first. So much so that I didn't want to play it again. But I did play it again. And again, until I eventually came to love the atmosphere, the music, the emersion, even the admittedly awkward controls. It became THE most memorable experience of my gaming career, and my only regret is that it was so memorable, that I actually found it boring on the second time through, since I knew where to go and what to do, and that was two years later. I'm very happy to have experienced it, and I'm glad it got the review it deserved. Thank you. @Stuffgamer1, Zelda, Mario and Castlevania all were 2D initially, just because the tech didnt allow anything else. And all of them did good transitions to 3D with the N64. 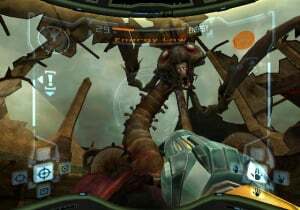 Metroid Prime saga became the very best metroids, backed up by sales numbers. And Metroid Trilogy is without doubt the Nintendo product (not really Nintendo ...) with best ratio quality/price. ^Castlevania didn't have a good transition at first, and Super Mario 64 made the transition by putting the gameplay on its head. Wait, really? Dadgummit. I thought you were initially investigating the planet, but then when the self-destruct initiated you had to escape to a near-by planet. I was playing 2 at the same time so apparently I got the deets a little screwed up--thanks for the catch and I'll be sure to try and fix that! Good game. Beautiful graphics showing that smart programming can compensate for lesser hardware. Beautiful enemy design along with the second one and wonderful transition to 3D. Great way to open up a trilogy. @57: You're giving 3 examples of franchises that did make the jump to 3D well (of which one didn't) to prove that all franchises made the jump to 3D well? It was mostly the first person thing anyway, since Metroid had plenty of platforming, which shouldn't work in first person. Most certainly a masterpiece for the annals of video gaming history; the music, systemically organic storytelling, visual style--all these and the overall "soul" that was injected into this project is what makes Prime and its spawn toward "Corruption" a rare gem. I remember pondering (back in the day) simply in terms of graphical presentation how this "tiny" cube machine could produce a game far visually superior to any of the games on the supposed Microsoft "powerhoused" box. Maybe I'm wrong on this point, and admittedly, biased. Regardless, I agree with Mr. Crites here that the art direction and various storytelling elements that form the essence of Metroid Prime--even still in 2011--make me want to come back and immerse myself in the mythology of Prime. This desire still burns despite knowing the world of Tallon IV like the back of my hand. I will admit I probably played this game far more than what is reasonable. The controls were sometimes frustrating, but, back then you simply had to adjust to the rules governing the Gamecube controller. However, once I mastered the controls I found that I could control Samus quite fluidly throughout the game world. Quite frankly, this game beckons true video game aficionados to enter "OCD mode," and, for an individual temporarily taking such a risk against one's own sanity and social life--one does not come out of Metroid Prime unrewarded. It's almost as if your own mind has been affected by the phantasmagoric Phazon metaphor, never to be truly recognized as it once had been--again. Yet, Samus you remain. On a side note I recently espied the Wii Metroid Prime Trilogy selling second-hand for 70 pieces of lettuce at Gamestop. Now that was a WTF moment! If you have not played any of these, it is a huge shame and you should. I think the first is the best but thats just me. They are all fantastic games. They surprisingly havent aged much at all and sitll look amazing and play well too. Oh did I also mention that these games all have amazing music in them too. Lets face it The metroid Prime games are almost perfect in every single aspect of videogaming. @warioswoods Yes Iliked it so much I used it as my profile. I thought it would have been a great idea if they would have taken you to each respective title screen when you choose the game you want to play in Metroid Prime Trilogy. 9. GreatCrippler "The 3d platforming alone should make this lose 2 points. Calling one of the more mediocre games in the series a 10 seems a bit much. Fusion was near perfection, and only warranted a 9 from here. This one is a 7 tops." It's a great game, but I'm mystified why the clumsy and unintuitive lock on system isn't mentioned bringing it down a good point. It's not a problem for a lot of the game but when you get into the later parts where it's common to have fast shooting/strafing space pirates and especially in the omega pirate fight it's just down near unbearably aggravating when you have to stand there, get shot up some, just to get a lock so you can strafe and fire on your target with equal footing. I'll always say a decade later their largest mistake was wasting the c-stick for visors instead of aiming. Anyway, I can't help dusting off this game and playing it again, despite having already beaten it and 10 years passing since its release. That alone should say something. Nintendo Life, after this game maybe you should add another number point in your review system so you can give this an 11. Though O can't see what other game critics think about this game because Metacritic won't pull up when I hit the link. Any advice? Anyway this is worth a 11. Sorry if you see the O, I meant type I. @citizenerased Echoes is another 10/10 for me with corruption getting an 8.7/10 for its low difficulty. Echoes just had the best design out of all. So great I brought this game twice. The WiiU game version does not even do all the affects of the original GCN game.